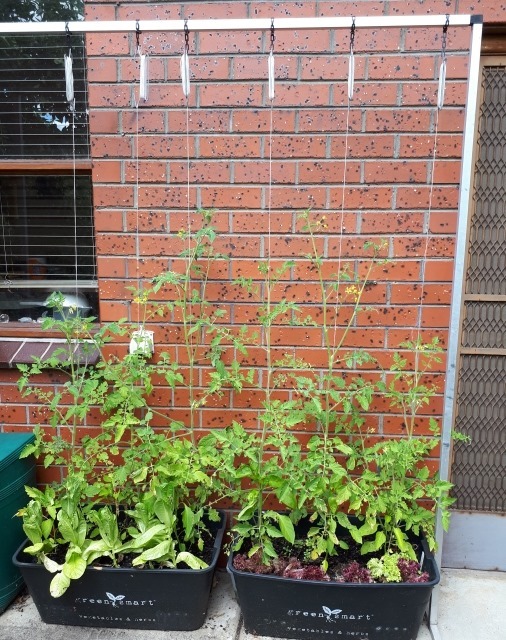 Want to grow lots of tomatoes in limited spaces, even containers? Ever wondered how the commercial hydroponic growers pack in as many plants as possible in their growing areas? By understanding the way tomatoes grow, we can select the right plants and utilise their growth habit for maximum production in the smallest of spaces. Tomato varieties are classified into two categories based on their growth habit, determinate and indeterminate. Determinate tomato varieties are known as ‘bush tomatoes’, they grow into a self-supporting small bushes up to 1.2m (4’) tall that don’t need staking, They grow to their full size, then produce flowers at the ends of all their branches (shoots), producing all the tomato crop at once. 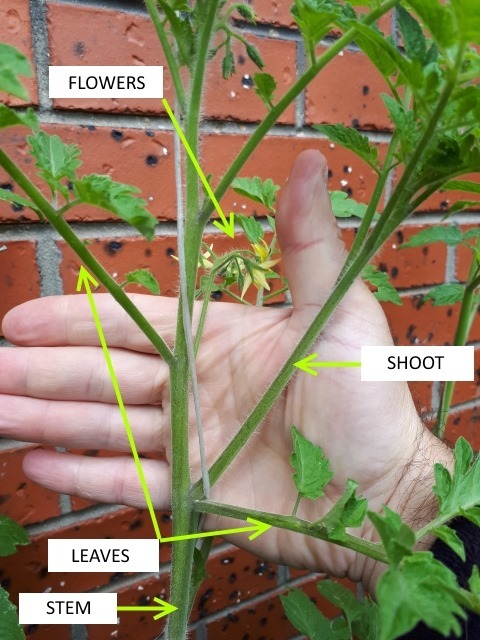 Indeterminate tomato varieties are known as ‘vining tomatoes’, they grow very long stems around 2m (6’) tall which branch heavily and require staking or tying to a support to keep them off the ground, Flowers are produced along the sides of the branches (shoots), and the plants will continue to grow until the cold weather arrives. Since indeterminate tomatoes flower alongside any new shoots that emerge, and continue growing after flowering, their continuous productivity makes them ideal plants for intensive growing systems. A plant’s available growing energy can either go into vegetative growth (leafy green growth, basically leave and branches), or flowering and fruiting productive growth. We can direct the plants growth into flowering and fruiting simply by preventing the growth of new shoots (branches) by pruning them off. Unlike determinate bush tomatoes which fruit at the ends of their branches and therefore need branches to fruit, indeterminate tomatoes don’t. A stem and leaves will do the job. 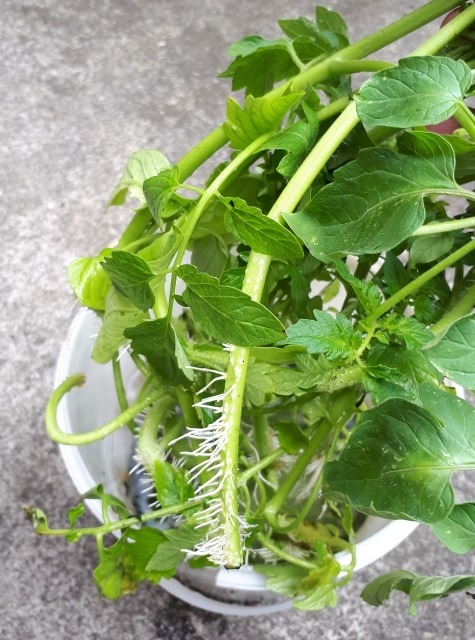 As we can see in the picture below, cutting off the new shoots (branches) growing from stem does not affect the flowers, as the flowers are produced on the stem. 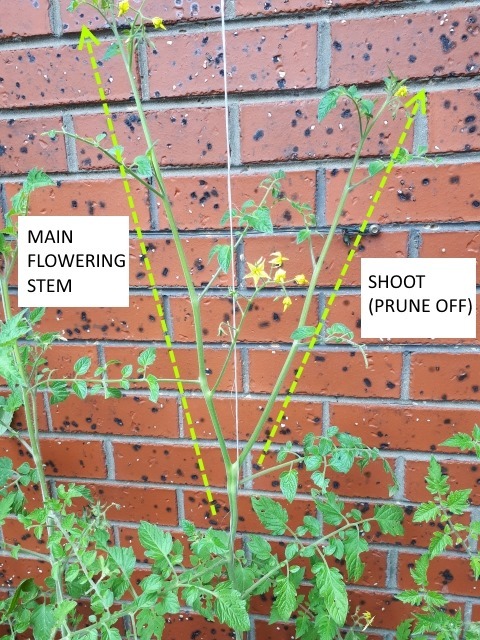 If we prune off all new shoots (branches), we end up with a tall plant that is comprised of a stem with leaves along its length and flowers emerging from it – basically a columnar (tall and narrow) tomato plant, the ideal shape for intensive plantings where many plants are fit into a small space! Don’t throw away any shoots that are pruned off, they can be very easily turned into new tomato plants! Just put them in a bucket with some water in the bottom, and locate in a protected area exposed to morning sun only. In a few days the cuttings will put out roots! When tomato plants are pruned to be tall and narrow, they can space them quite closely, even in containers. 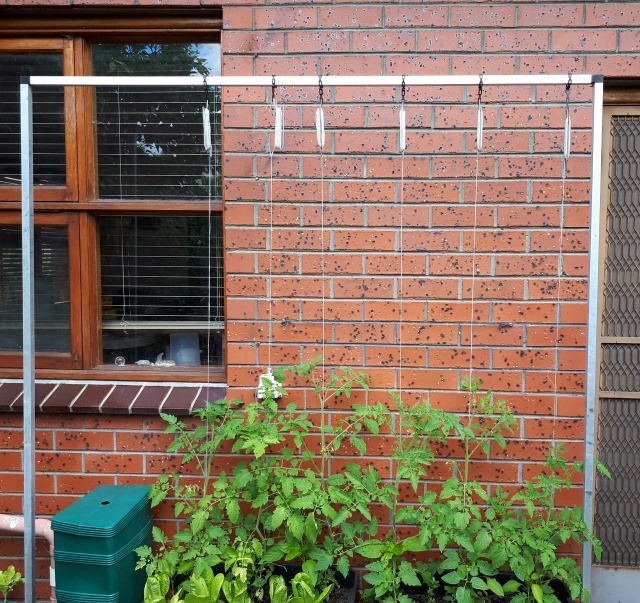 Pictured below are three tomatoes planted side-by-side in two self-watering containers, supported by strings attached to an overhead frame. The pots are 70cm (28”) wide, with the tomatoes spaced around 25cm (10”) apart, quite an effective use of space! 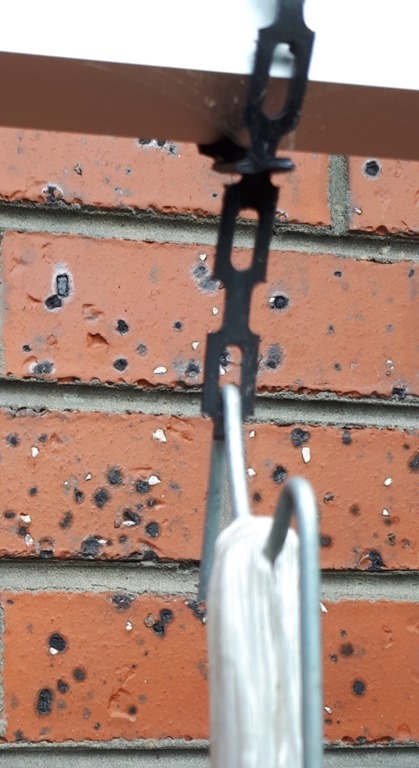 To support tomatoes on strings, as they do in hydroponic setups, attach hydroponic tomato clips (as pictured below) to the base of each tomato plant, then tie the string to the top of any overhead support, then wind tomato stem around the taught string. 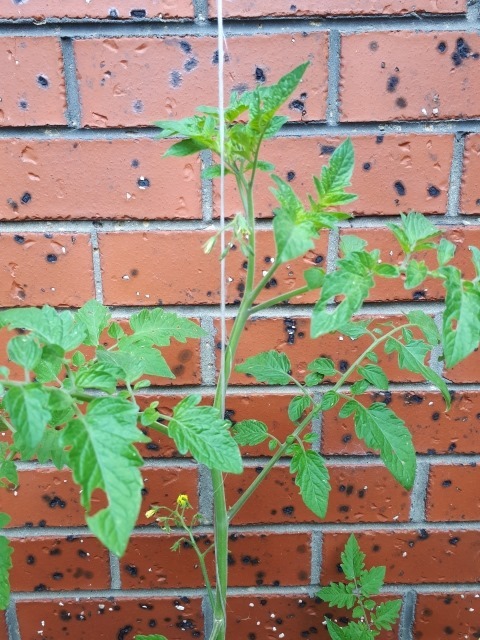 Here is a tomato stem supported on a string, the stem is just wound around the string as it grows, and any new shoots (side branches) are pruned off. This maintains the narrow shape as the tomato grows upwards only. Using such a setup, it’s possible to grow tomato plants extremely closely, and it’s cheaper than using wooden stakes. 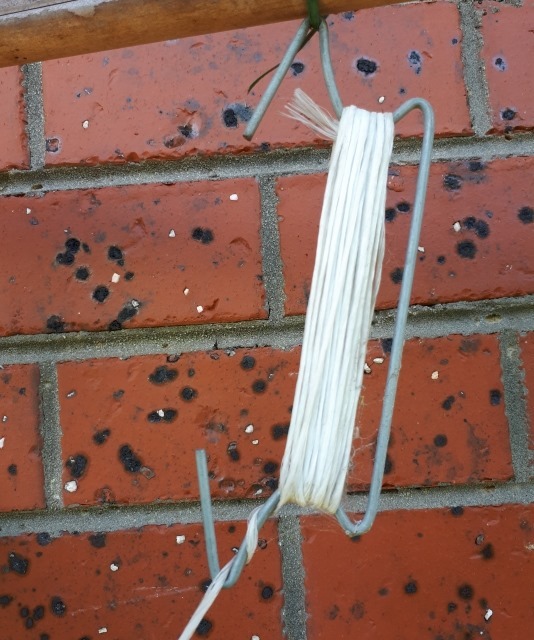 The plastic string lasts several years, and is extremely cheap to replace. I constructed my support frame out of square aluminium sections that connect with plastic fittings which just push together, all purchased from a local hardware store. Since these materials don’t rust or crack, they can withstand the weather and last almost indefinitely. 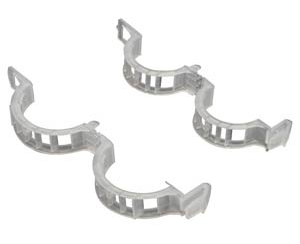 There is no limit to what can be used as an overhead support to attach the strings to. Two wooden tomato stakes in the ground with at third lashed to the top to form an inverted ‘U’-shape will work perfectly well in a garden bed. For spacing, I’ve used a distance of 45cm (18”) between plants in the ground in garden beds, and in my experience this provides plenty of air circulation to prevent diseases. 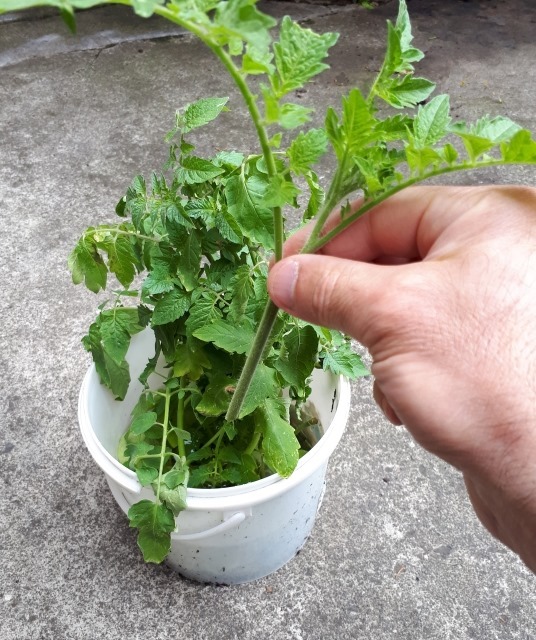 When planting in the ground, I always remove all leaves off the bottom 30cm (12”) of the tomato plant once it’s tall enough, as this prevents soil splash from the rain reaching the leaves which causes that all too familiar disease where to bottom leaves dry out and the infection slowly spreads upwards. Using a thick layer of mulch also helps considerably in preventing this problem. In conclusion, we can exploit the growth habit of indeterminate tomatoes and borrow some tricks from hydroponic tomato growers to create high density, high productivity planting in the smallest of spaces. If you like experimenting and trying something different, I recommend trying these ideas out. 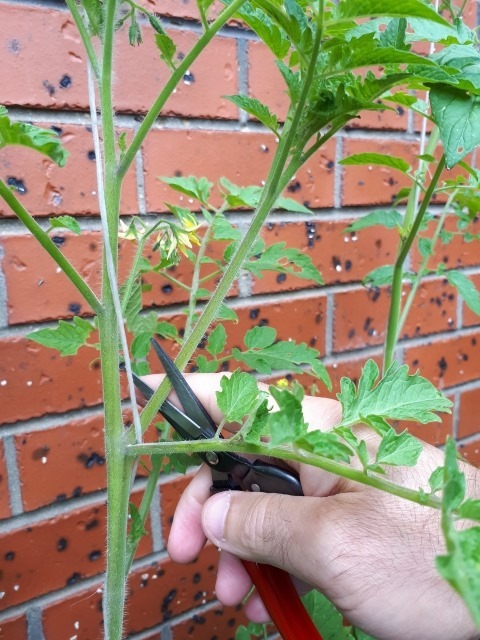 Traditional tomato growers can still stake up and prune indeterminate tomatoes into columnar shapes this way to squeeze way more tomatoes into a garden bed than was ever possible! This entry was posted in Gardening Information, What's New! and tagged determinate, growing tomatoes, hydroponic tomatoes, indeterminate, intensive tomato growing, tomato string support. Bookmark the permalink.